Jennifer Lawrence has such a strong, plucky and extroverted personality that it is disconcerting to see her play a flat and simple-minded cipher. mother! has Lawrence not as a mother or even an expectant mother at first, but as a homemaker who dotes on her large ego renown poet husband (Javier Bardem). The camera almost never leaves the inside of their cottage home that rests in the middle of nowhere, surrounded by forest. This Darren Aronofsky film is a demonstration of horror, of how this young woman will be undone, and destroyed. It is an art film, but I don’t think it’s a good one aside from a few powerful ephemeral moments late in the game. Two strangers make an intrusion into their home in the film’s vapid first section, played absurdly by a self-asserting Ed Harris and worse by Michelle Pfeiffer, who turn out to be less important people than they originally claim to be. But Bardem refuses to kick them out of their house, not when they are inconsiderate and not even when they turn belligerent. If you’re wondering why he’s like that, well, the answer is he’s an attention whore. He represents the modern typical male, the media age status seeker addicted to intrusions as long as it can boost his celebrity and ubiquity. Yes, this is opposite of what the home was supposed to provide – solitude and tranquility. 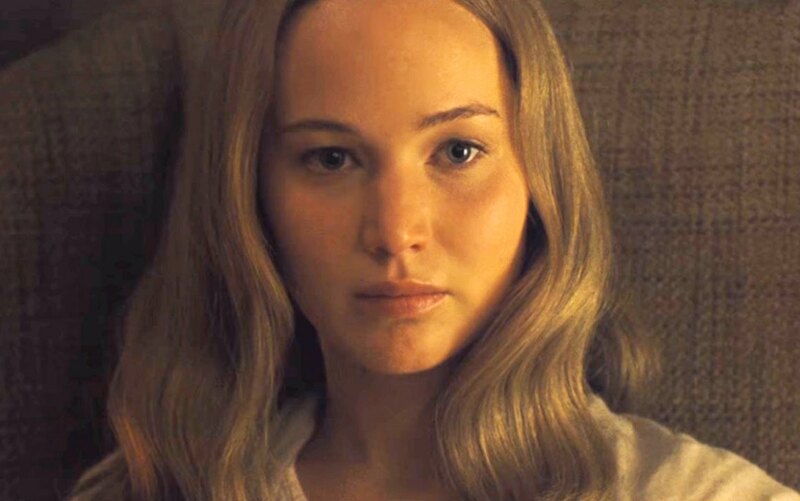 Regardless of the little impression Bardem gives us, the camera is fixated on Lawrence’s face for the bulk of the time, the film’s definite stylistic strategy, only to give us jagged little cuts of what she sees, of what is bothering her. She is at times hallucinating (bloody vaginal-shaped orifice in the floor, heart-beating behind the bathroom tile), and what we see from her point of view are mere glimpses. She comes off rather normal nonetheless and yet is told, repeatedly, that everything she says and does is wrong, rude, out of step. If you want me to point out a really absurd scene, try Lawrence cooking breakfast, going to answer the door in thirty seconds, and suddenly the grill is smoking up and the fire alarm goes beeping, and somebody accidentally gets burned trying to take the skillet off the grill instead of just turning off the damn stove. Or another absurd scene where Bardem’s work is written on one-page antique-ish brown paper and its treated supposedly as the greatest work since Aristotle (Bardem’s poetry as world-changing, yeah right?! ), although there’s not a moment in the film where Bardem – who can play worldly arrogance very well – seems even in the slightest imbued with a sense of humility or humanity. Aronofsky (“Black Swan,” “The Fountain”) is of course a technically excelled craftsman, and so every calibrated closeup shot of Lawrence’s face, as she moves or as she shudders still, evokes a certain feeling in the viewer – although sometimes that feeling is just restlessness. Lawrence is pregnant in the third trimester when we get to the final third of the film after the film has skipped ahead many, many months. And it is then when too many strangers representing different factions (rabid fans, religious cultists, terrorists, more), turning this once tranquil house into a debauched rococo, and furthermore devolving into a nest of unbridled destruction, that Aronosky’s surrealist visual inventions finally excited me. Why can’t a woman just have a baby in this day and age live in peaceful existence without her child being sucked into an affiliation or representing some damn cause? I believe that’s what the film is partly saying. The film has metaphors, and more metaphors, and more still. It’s nothing but metaphors. Some of them connect. And some of them, especially in the closing scenes, just evaporated into nothingness for me. Many out there will have some hullaballoo interpretation that will connote religious grandiosity. I didn’t bite whatever bait it was feeding me. Films like “The Tree of Life,” “Samsara” and “Life of Pi” are clear-cut, coherent (at least to me) allegories that even have a reminding touch of how beautiful the planet is. On the other hand, “Antichrist” by Lars von Trier was one the darkest of allegories in recent years, but it confronted and deconstructed evil and forced a character to make a demanding choice about whether to let go and give up on a spouse whom was on a downwards descent into hell. 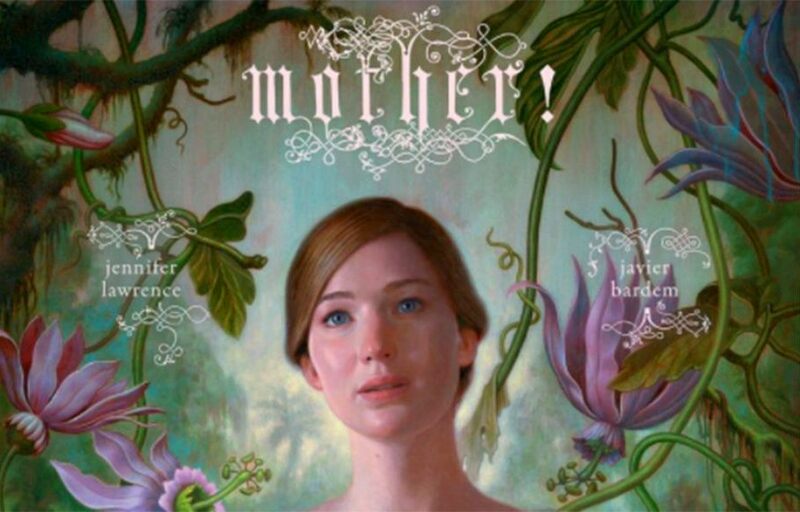 “mother!” with Lawrence as its helpless victim has none of those comparative qualities, and what is interpretable is momentarily thought-provoking, yet downhearted and putrid. Film Cousins: “The Exterminating Angel” (1964, Spain); “Rosemary’s Baby” (1968); “The Devils” (1971); “Black Swan” (2010).